Take up to $40 off bookings when you use the coupon code to check out at CheapOair. Some conditions apply. Click "Redeem Now" to see more about the discount. Book now! Drive away with rental car savings Today! Save up to $10 with the coupon code at CheapOair. Applies to all domestic travel. Click "Redeem Now" to visit the online site of CheapOair. Display your coupon code to save up to $15 your purchase at CheapOair. Applies to all domestic travel. The advertised promo code provides discounts against our service fees on stated routes. Coupon code and instant savings offers can be combined up to the amount of our service fees. Excess savings will not be applied. Coupon code expires on date indicated and can be withdrawn at anytime without notice. The standard service fees are $28 per person one-way/roundtrip for economy class tickets. Click "Redeem Now" to view the online site of CheapOair and book now! Apply the coupon code at checkout to enjoy the roundtrip flights under $150 at CheapOair! Click "Redeem Now" to view the online site of CheapOair. Book now! Adventure travel deals! Use the coupon code to save up to $15 off your fees at CheapOair. Click "Redeem Now" to view the online site of CheapOair. Book now! Cheap airline deals! Take $15 off your orders at CheapOair with the coupon code at checkout. Click "Redeem now" to view the online site of CheapOair. Book now. Europe travel deals! Apply the coupon code to save up to $30 off your orders at CheapOair. Click "Redeem Now" to visit the online site of CheapOair. Book now. Tropical getaway deals! Save up to $40 off your orders at CheapOair with the coupon code at checkout. Click "Redeem Now" to visit the online site of CheapOair. Book now. Last minute flight deals! Use the coupon code to take up to $15 off your orders at CheapOair. To view the online site of CheapOair, click "Redeem Now". Book now. See cities around the world! Apply the coupon code to enjoy up to $15 off your orders when checking out. Click "Redeem Now" to visit the online site of CheapOair. Applies to all international travel. Book now. Plan your vacation with CheapOair and save on the top 25 deals! Apply the coupon code at checkout to save up to $25 off your orders at CheapOair. Book now! Applies to all domestic travel. Restrictions apply. Enjoy up to $100 off your business class flights with CheapOair by entering your promo code at time of check out. Restrictions apply: Applies to 2+ traveler. The advertised promo code provides discounts against our service fees on stated routes. Discount valid on a minimum booking value of $500. Promo code and instant savings offers can be combined up to the amount of our service fees. To view more about the promotion, click "Redeem Now" to log onto the online site of CheapOair. 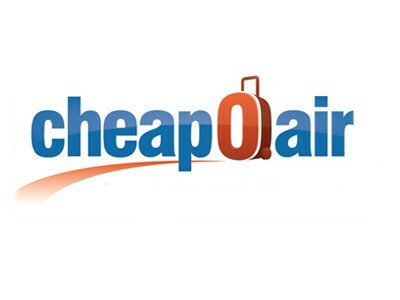 Apply the coupon code at checkout to enjoy roundtrip fares under $199 at CheapOair. Click "Redeem Now" to log onto the online site of CheapOair. Save big on military airfares & get up to $30 off your orders with the coupon code at CheapOair. View the online site of CheapOair by clicking "Redeem Now". Exclusions apply. Save big on senior airfare deals! Get up to $30 Off your orders with the coupon code at checkout from CheapOair. To view the online site of CheapOair, click "Redeem Now". Exclusions apply. Use the coupon code to save up to $30 off student travel tickets at CheapOair. Click "Redeem Now" to log onto the online site of CheapOair to find out more promotions! Exclusions apply. Use the promo code to save up to $30 off gay & lesbian travel delas on all domestic flights at CheapOair. Click "Redeem Now" to enter the online site of CheapOair. Book now! Take up to $50 off fees with your coupon code at CheapOair. Press"Redeem Now" to view more about the discount. Here come vacation package deals. Get up to $60 off fees with your coupon code applied at checkout in CheapOair. Applies to 5 Passengers only. Click "Redeem Now" to log onto the official site of CheapOair to view more details. Save up to $15 off snag roundtrip flights under $150 when you use the coupon code to check out at CheapOair. Restrictions may apply. Click "Redeem Now" to see more about the discount. See cities around the world! Save up to $15 off your entire orders when you apply the coupon code to checkout at CheapOair. Some exclusions may apply. To see more about the discount, click "Redeem Now". Fly to New England for less! Take up to $30 off your orders with the coupon code applied at checkout on CheapOair. Exclusions may apply. Click "Redeem Now" to enter the online site of CheapOair and see more about the discount. Jump for a great stay! Take up to $10 off hotels when you apply the coupon code to check out at CheapOair. Restrictions may apply. To see more about the discount, click "Redeem Now". Last-minute weekend getaway deals! Take up to $15 off your purchase when you use the coupon code at checkout on CheapOair. Some exclusions apply. Click "Redeem Now" to see more about the discount. Take up to $60 off bookings with the coupon code applied at checkout when you make the purchase at CheapOair. Exclusions apply. Click "Redeem Now" to see more about the discount. Use the coupon code during checkout at CheapOair to save up to $30 off on all domestic flights. Restrictions may apply. Click "Redeem Now" to see more about the discount. Apply the coupon code to save up to $30 off CheapOair's sizzling summer deals at CheapOair. Restrictions may apply. Click "Redeem Now" to see more about the discount.